Here is the weekly review of the top performing Sea Lions alumni, who are currently playing in pro basketball. #1. 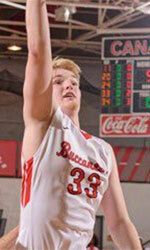 Hayden Lescault (6'5''-G-92, graduated '15, plays pro in Austria) led Unger Steel Gunners Oberwart to a victory over one of league's weakest teams UBSC Graz (6-13) 81-67 in the Austrian A Bundesliga on Thursday night. He was MVP of the game. Lescault scored 18 points, had 5 rebounds and dished 4 assists in 31 minutes. Unger Steel Gunners Oberwart (14-5) is placed second in the A Bundesliga. It was his team's third consecutive victory in a row. Lescault has individually a very good season with high stats. He averages 15.7ppg, 4.6rpg, 6.4apg and 2.1spg. #2. 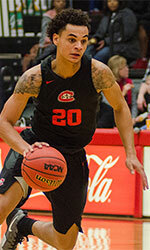 Oivind Lundestad (6'5''-G-91, graduated '14, plays in Norway) was the main contributor in Centrum's victory against the closely-ranked Tromso (8-9) crushing them 101-79 in the Norwegian BLNO in Sunday night's game. He was MVP of the game. Lundestad scored 38 points (!!!). Centrum Tigers Oslo (7-11) is placed seventh in the BLNO. It was his team's third consecutive victory in a row. It's Lundestad's first season with the team. He has very impressive stats this year 19.3ppg, 2.6rpg and 1.8apg in 18 games he played so far. #3. Skyler White (6'8''-F/G-93, graduated '18, currently in Portugal), who plays in the Portuguese LPB could not help Terceira (6-9) to beat Oliveirense (4-8). He scored 8 points, had 7 rebounds and made 2 blocks in 33 minutes. Terceira was crushed 77-51 on the road by the lower-ranked Oliveirense (#9). It's White's first season with the team. White has relatively good stats this year 14.9ppg, 7.7rpg, 1.3apg and 2.1bpg. White is a former Eurobasket Summer League player, which is considered top summer league for players who want to play basketball overseas. #4. Marek Klassen (6'1''-G-92, graduated '15, plays pro in Turkey) was the major contributor in a Socar Petkimspor's victory against the league outsider Edirne (2-13) crushing them 101-77 in the Turkish TBL (second division) on Saturday night. He scored 14 points, had 5 rebounds and dished 5 assists. Socar Petkimspor (8-7) is placed seventh in the TBL. It's Klassen's first season with the team. Klassen has relatively good stats this year 11.7ppg, 3.1rpg, 4.4apg and 1.1spg in 15 games.